Dunk Tanks have been delighting crowds for years. 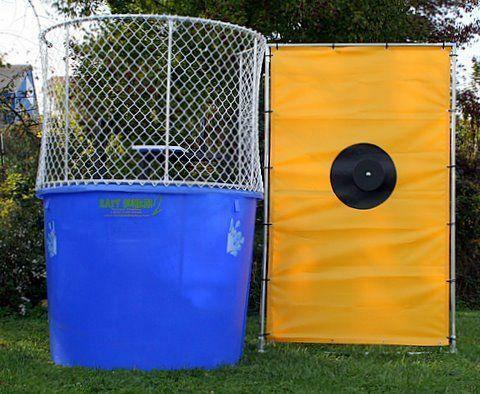 The concept of dunking the boss at the company picnic has become an American pastime and this Premium Style Dunk Tank is the best available in the state of Florida. This eye catching dunk tank is blue in color with a yellow back drop. Dunk tank holds 500 gallons of water and will accommodate guest up to 250lbs. Dunk Tank is trailer mounted and comes with a self-contained travel dolly/hand-cart that also functions as the climbing ladder to the “Dunkee’s” platform.GREAT FOR CORPORATE EVENTS OR PRIVATE PARTIES! *If going in a backyard, it requires a 6 and a half foot opening. *CAN NOT be lifted over fences.